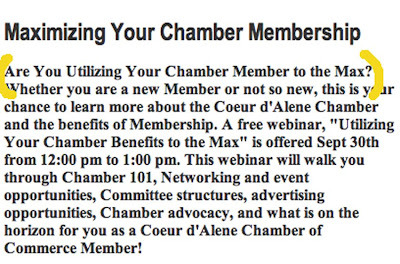 Once again, the Coeur d'Alene Chamber of Commerce sent out one of their high quality, well written emails to their entire database. 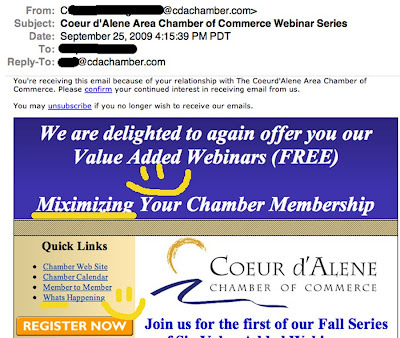 This one offers a FREE webinar which will help miximize Chamber Membership. 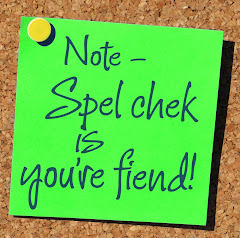 A quick look at the Urban Dictionary shows to miximize is to maximize "the variety of world views and lifestyles you allow into your field of experience." Um. Yeah. Sure. After those two doozies, I can totally forgive the missing apostrophe in "whats happening". 31 Days Has September... wait...what?? Fast Food on Every Corner! Y'All Come Find Us, Ya Hear?